One of the strongest role models for girls in South America in the last few decades has been Laura Montoya, a Colombian nun who was canonized by Pope Francis on May 12, 2013. Maria Laura Montoya Upegui was born in Jerico in Colombia in 1874, just before the start of the Colombian Civil War in which her father was killed. This left her family with no one to provide for them. Laura was sent to live with her grandmother, where she was very lonely and felt abandoned by her family. She spent much time in prayer and in reading Scripture, even as a child, to overcome this loneliness. As the girl grew older, her mother needed financial help and wanted her daughter to train as a school teacher to earn money. She was sent to teach the indigenous peoples of Colombia and eventually began working as a missionary to them by teaching about the Catholic faith as well. Many Colombians viewed indigenous peoples as less than human, but Laura knew this was not the case. By the time she reached her early 20s, Laura very much wanted to become a cloistered Carmelite nun, but her experience as a missionary left her with a desire to spread the Gospel to others, particularly people who were discriminated against such as the native groups she had worked with. In 1914 she founded the Congregation of Missionary Sisters of Immaculate Mary and Saint Catherine of Siena. She left the city of Medellin, where she had lived, and traveled to the jungles by mule to live among the native people who were the poorest and most discriminated against in society. 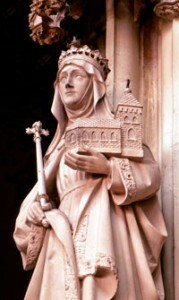 Although the bishop supported her work, many other Christians felt the effort was wasted. Laura ignored the criticism. 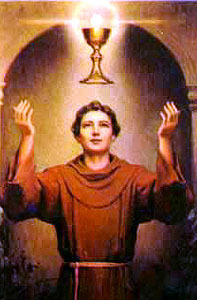 Her spiritual writings were aimed at her nuns, helping them better to understand their call to serve God among the native peoples of South America. Mother Laura, as we was known by her sisters, spent the last nine years of her life in a wheelchair in great pain. She died October 21, 1949, in Medellin. Today, the sisters of her order work in 21 countries in the Americas, Africa, and Europe. At her canonization ceremony, Pope Francis praised Saint Laura for “instilling hope” in the indigenous people of her nation and for teaching in a way that respected their culture. 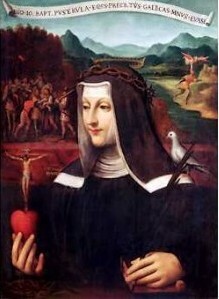 She was Colombia’s first saint and the patron saint of orphans and people who suffer from racial discrimination.